Originally from Maryland, Staci Gulbin started writing professionally in 2010. Her work has been published on a Baltimore news website as well as other online entities. Gulbin holds graduate degrees in biology and nutrition from New York University and Columbia University, and is a registered dietitian and certified personal trainer. Calcium is the most abundant mineral in the body and functions not only in the development and maintenance of bones and teeth but also in the health of nerves, muscles and the heart. Calcium deficiency can lead to serious health problems such as bone weakening, nerve damage and heart arrythmias. However, increased blood calcium levels, or hypercalcemia, may also cause health problems such as kidney stones or calcium crystal formation in the arteries and organs that can cause pain and dysfunction of the affected areas. Some medications may cause increased calcium levels in the blood. The Institute of Medicine recommends that most adults should consume between 1,000 and 1,300 mg of calcium daily through consumption of calcium-rich foods such as dairy products, leafy green vegetables, salmon, sardines, tofu and fortified juices. Vitamin D intake, through sunlight exposure or supplementation, aids in the absorption of calcium. Proper calcium intake can prevent or treat such conditions as hypothyroidism, high blood pressure and osteoporosis. It is excessive intake of calcium, above 2,500 to 3,000 mg daily, that may contribute to increased blood calcium levels that can cause a variety of health problems, according to the institute. In addition to excessive calcium intake, certain medications may increase blood calcium levels, such as antacids, lithium, thiazide diuretics, thyroxine and vitamin D supplements. 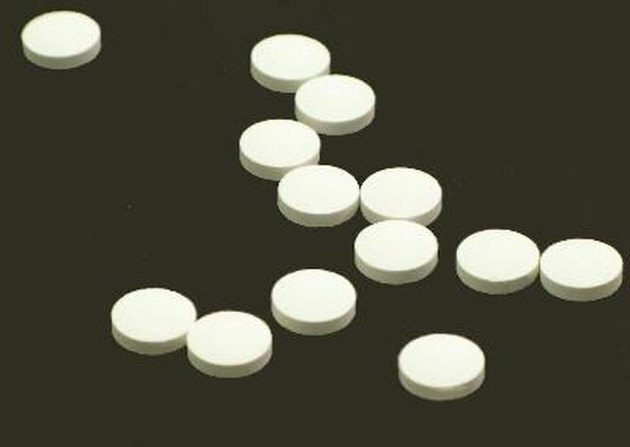 Thyroxine, used to treat hypothyroidism, and thiazide diuretics, used to treat high blood pressure, both increase secretion of parathyroid hormone. Parathyroid hormone regulates the level of calcium in the blood, the release of calcium from bone, absorption of calcium in the intestine and excretion of calcium in the urine. Increased secretion of the hormone can increase calcium levels in the blood. Normal blood calcium levels, according to Medline Plus, are between 8.5 and 10.2 milligrams per deciliter, with levels above that considered hypercalcemia. Hypercalcemia can lead to health problems such as renal insufficiency, vascular and soft tissue calcification, and kidney stones. The vascular calcification caused by hypercalcemia has been found to increase risk of coronary artery disease. Hypercalcemia may be caused by a variety of health conditions other than excessive intake of calcium, vitamin D or certain medication usage, including Addison's disease, HIV/AIDS, hyperparathyroidism, metastatic bone tumors, overactive thyroid gland, Paget's disease or prolonged immobilization. Therefore, before discontinuing use of any medication or modified diet due to a high calcium blood test, consult a health-care professional to determine the primary cause of your hypercalcemia and proper treatment. Calcium and Magnesium in Caltrate: What Does It Do for the Body?